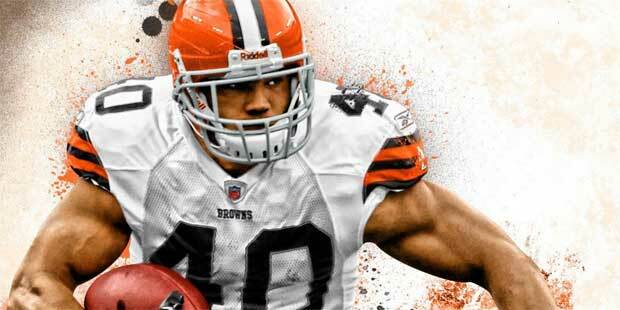 The fans have spoken, and Cleveland Browns running back Peyton Hillis is the cover athlete for the upcoming Madden NFL 12. Hillis beat out former Madden NFL 2004 cover star Michael Vick in an online head-to-head to logged 12.7 million votes between March 21 and April 27. “Our fans have responded in record-setting fashion to honor Peyton Hillis, and we’re extremely pleased to welcome him into an exclusive fraternity of NFL players to appear on the cover of the Madden NFL franchise,” said EA SPorts Senior Product Manager Anthony Stevenson. No mention on the over-under on when Hillis pulls a hamstring or gets attacked by a scorpion on the 20-yard line as part of the "Madden Curse." Madden NFL 12 is out August 30; we'll have more details on the game in the coming weeks.